If you live in the continental United States, we can ship you fresh soursop fruit, shipped from small farms in the Caribbean. It is shipped to Miami and our partner ships it to you via 2-day air. We ship the fresh fruit to the continental USA only. Because this is the only way to to get direct from the tree fresh soursop fruit, we use an express air shipping service and insulated boxes to avoid spoilage. And to ensure you get the freshest soursop fruit to your door. 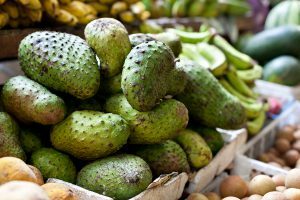 Is soursop fruit the same as Graviola fruit? Yes, same fruit, different name. 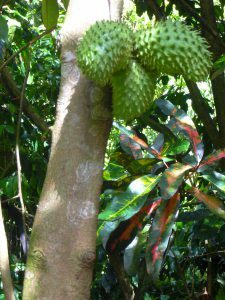 Is soursop fruit the same as guanabana fruit? Yes, also same fruit, but different name. 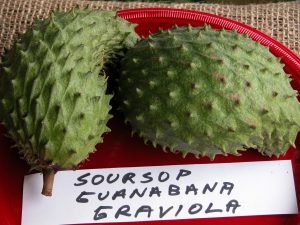 Guananbana is the Spanish name for soursop. Is the fruit processed? No, it is picked from the tree each Sunday, packed in a box, and trucked to the airport and shipped directly to you. How fresh is it? Our partner farmers harvest the fruit each Sunday and ship it to our customers by mid-week. Can I eat the fruit it as is? You will need to peel it as the fruit has a natural spiny skin. You need to scoop out the pulp and remove the seeds. Then you can eat it fresh and raw. Should I refrigerate it? Yes, immediately upon receiving your shipment open the box to ensure the fruit stays cool and then remove it and keep it cool to preserve its freshness. Is the fruit ripe? Generally, the fruit ripens between the tree and your doorstep. If it is not entirely ripe you can eat it in a few days. Expect it to ripen in the same manner that an avocado does. Can I freeze the pulp and juice? Yes, however, remove it from the spiny skin first. Want a larger order? In our shopping cart you can buy multiple boxes or contact us for larger or recurring orders.